Learn more about the Blink XT camera with customer reviews, pricing, key features, and frequently asked questions. Blink XT is a small security camera for indoor or outdoor use. The Blink XT is a totally wireless camera that connects to WiFi networks and is powered by a battery that can last for up to two years. Are the batteries in the Blink XT replaceable? Yes, you can replace the batteries when they die. The Blink XT uses 4 AA batteries. What is the Blink XT sync module? The sync module is a small box that comes with the Blink XT camera. This module is necessary to send your WiFi signal to the camera and communicate with the camera so that you can change the settings. Does the Blink XT work at night? Yes, the camera has an infrared night vision function that allows you to see crystal clear video feed at night. Can the Blink XT be used in any weather? The Blink XT is completely weatherproof. The out casing is waterproof, so you can leave it outside without damaging any of the components. What are some Blink XT alternatives? I have two Blink XT outdoor cameras - one over my deck and one on the side of my house where a privacy fence blocks the view of windows from the street. I like them. The storage is generous and it's free, unlike Ring's $30/year storage charge. It has quite a few options to customize the length of your clips, the quality and so forth. The one that gets the most motion alerts, the deck camera, gave me 11 months of battery life on two AA lithium batteries before I had to replace them which is pretty good. The app is easy to manage and well designed. The cameras pop off the included mount to replace your batteries but if you're going to have one in a public access area I'd buy a better mount. I bought one for the camera on the side of my house that houses the Blink in a metal box that a thief would have to unscrew to remove the camera. As I remember it was about $15.Both cameras work well with my Show and my Spot. It pulls video up as quickly as my Ring doorbell view. I have one XT with a base and it works well. Been using it for 3-4 months and the battery still reports OK. I would say the battery life is dependent on where it is placed and how it it is setup (recording time) In a high traffic area it will not last as long. 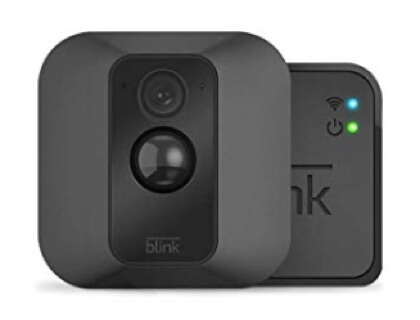 I recommend the Blink XT which is the black variant and it is compatible with indoor/outdoor application.It is also capable of recording up to 1080p.Even though the Blink camera (white) is way cheaper, the Blink XT (black) is worth the price.The blink cameras are also compatible with Alexa and IFTTT smart home. You also get to enjoy free cloud storage of your recorded videos. Blink’s app user interface is very intuitive and it is one of the best in the market, Blink cameras are reliable and awesome.